On the 24th of November, three groups got selected to go to Cows Create Careers program in Wodonga. We left at 9:30 and got there at 10:30. Seven other schools in the North East region participated in the program. During the presentation they talked about the program and how it runs. We had a quiz and two people from each school had to get up. The Quiz was about Cows Create Careers program and the things we have learnt by participating in the program. Unfortunately we lost the quiz by one point in the finals. We then had another activity, which was to make a cow and name the four stomachs and the careers pathway in the dairy industry. Once again we missed out by one, and came 2nd. We then had another activity which was taste testing of dairy products and what their fat content was. Finally we won an activity! It was time for the final results of the North East Region for our group presentations. Team Oreo from 7.5 came 2nd who was Tayla Ramsay, Elissa White, Gabriel Martinell and Brayden White, they all won itunes vouchers. Team ‘Cows are awesome’ from 7.1 came a draw in first place with Corryong. 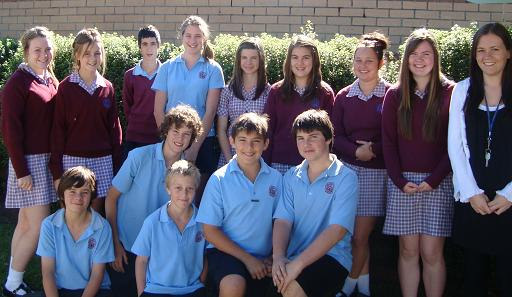 In the Team there was Lauren Robins, Tess Keenan, Annie Jordan, Jayden Bear and Douglas Mannnion Hunter. They all got rewarded with $50 each. Our school was the winner of the North East Regional School. Our school got $500 to go towards the Junior Science department. Overall we would like to thank Miss Nordan and Mrs Murphy for taking us, we had a great day.